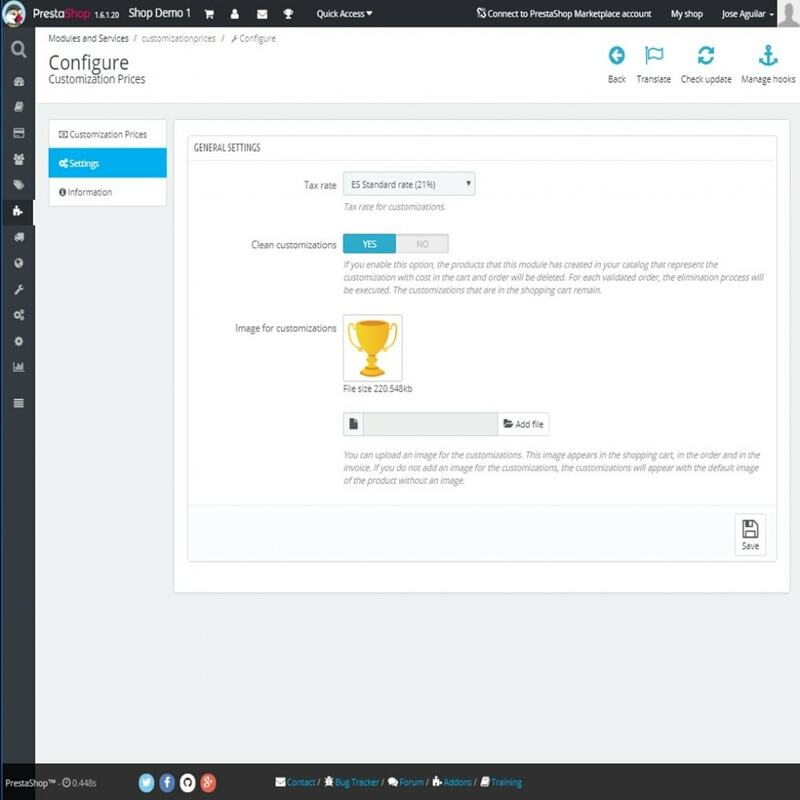 Earn extra money with product customizations. Increase the average price of the cart. 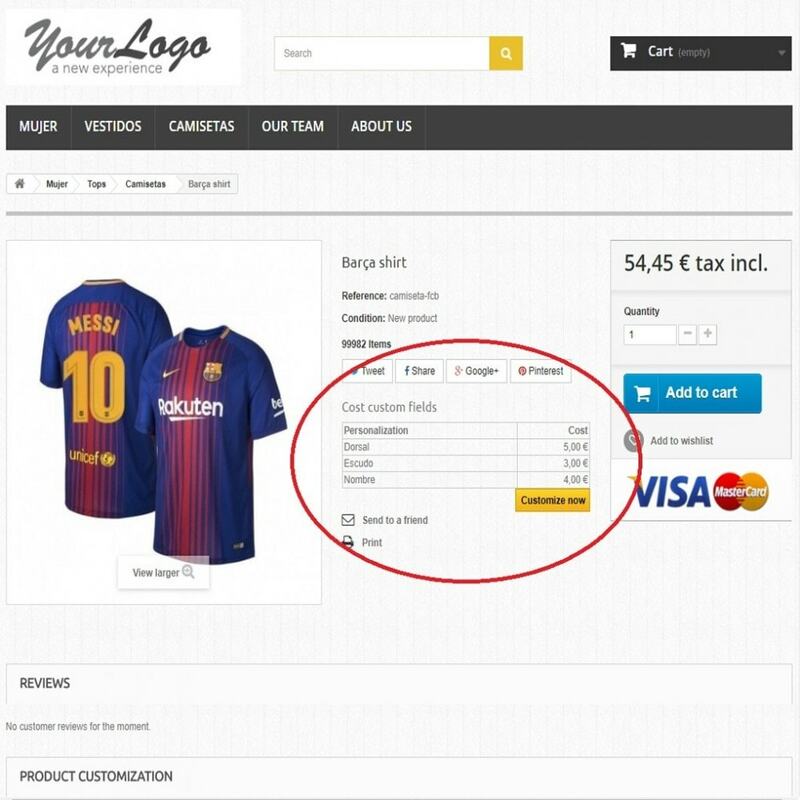 Informs the customer of the cost of the customizations on the product page. 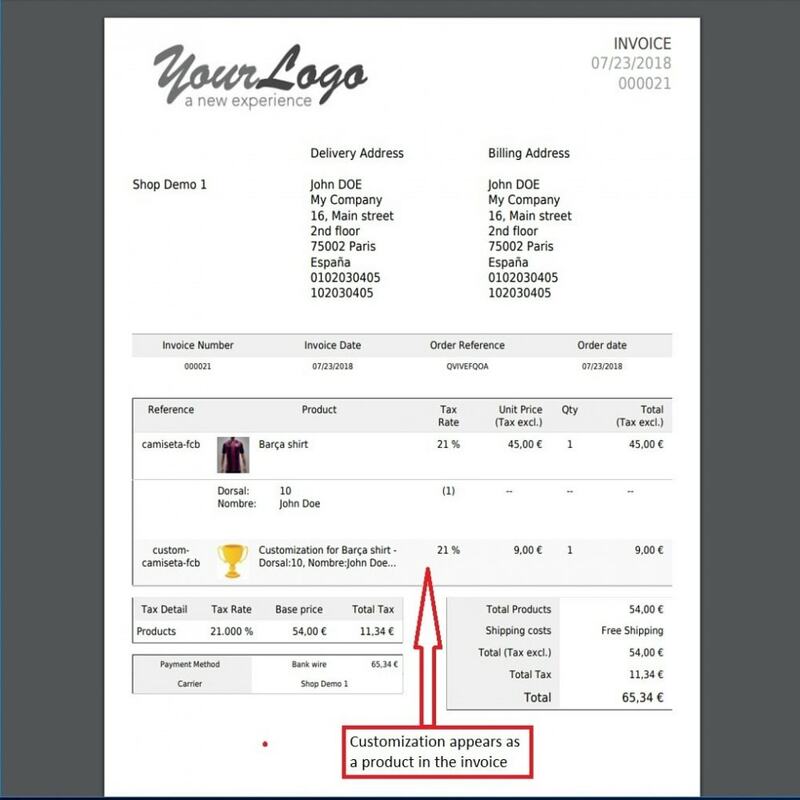 This module can be very useful for shops that allow the customer to customize the product and want to add a price to customizations. For example, a t-shirt store can offer the customer the possibility of customizing the shirt he buys. A possible personalization for this specific case could be to add a shield, name or number on the shirt. This module allows you to add a cost to each custom field. For example, you can indicate that adding a shield costs €5.00, adding the name costs €3.00 and adding the number costs €4.00. 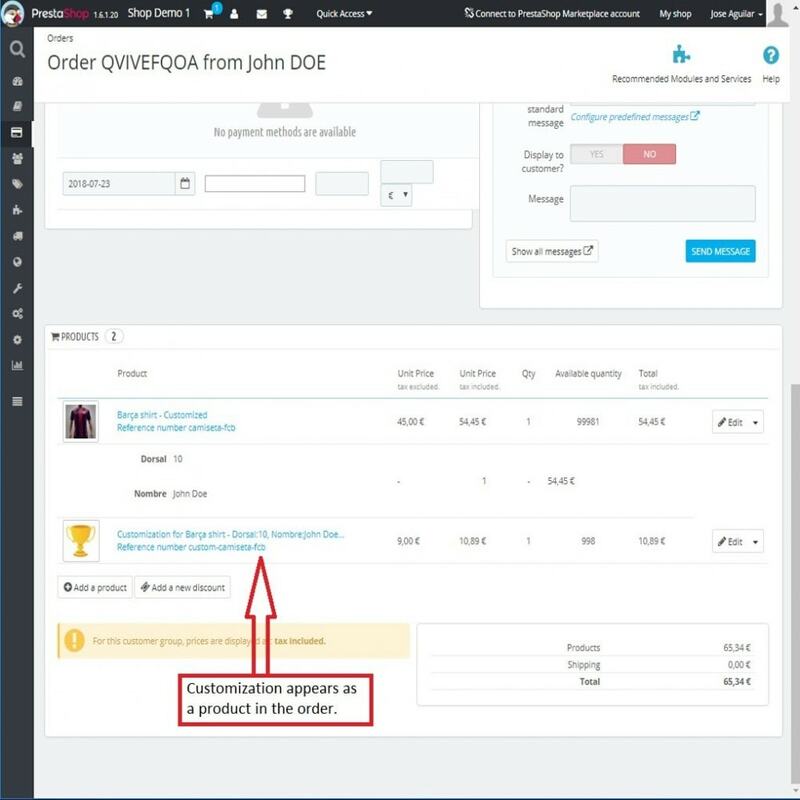 If the product without personalization costs € 40.00, by adding all the previous customizations and adding to the cart the total cost would be €52.00. In the cart, the customizations appear in a new line as if it were just another product. 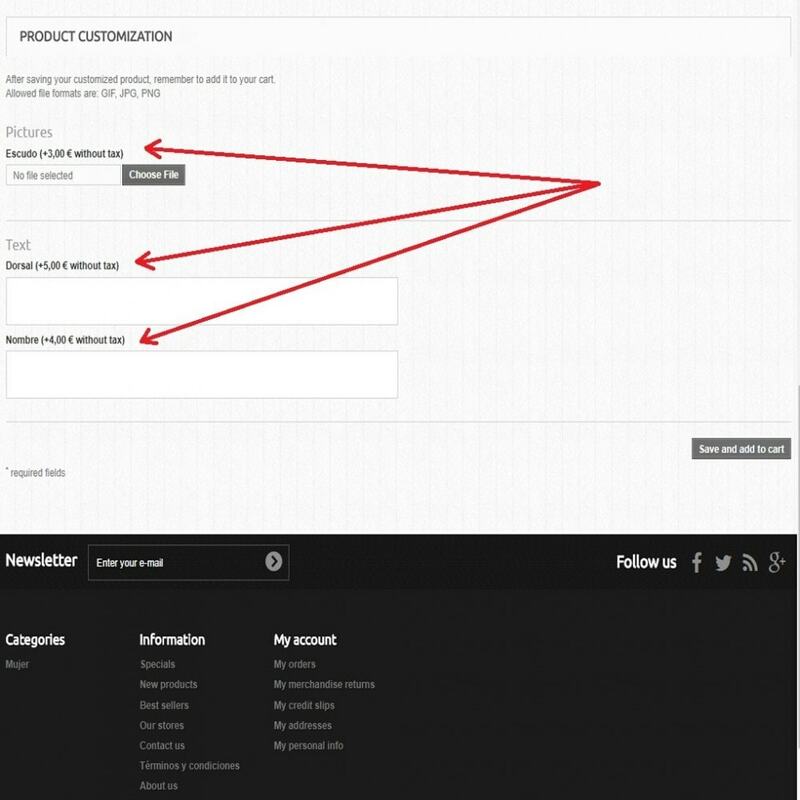 If you have not already done so, on the page to edit the product you must first create all the custom fields, as specified in the first images shown on this page. 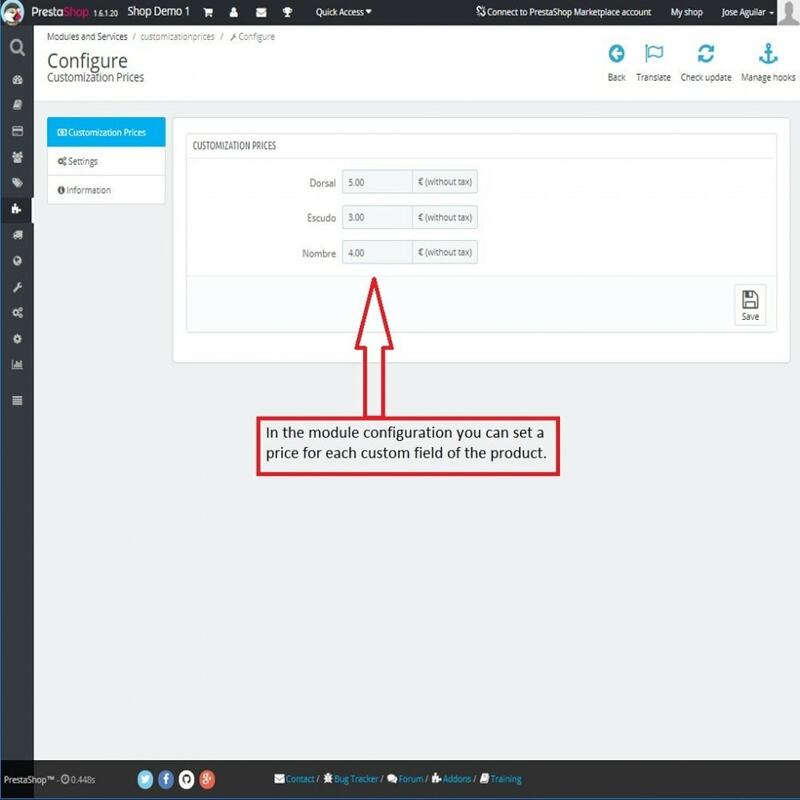 Once you have added all the custom fields to the catalog products, it is time to go to the module configuration to add a price or cost to each custom field. You have the possibility to indicate a tax rate for the customizations that will be applied in the cart. 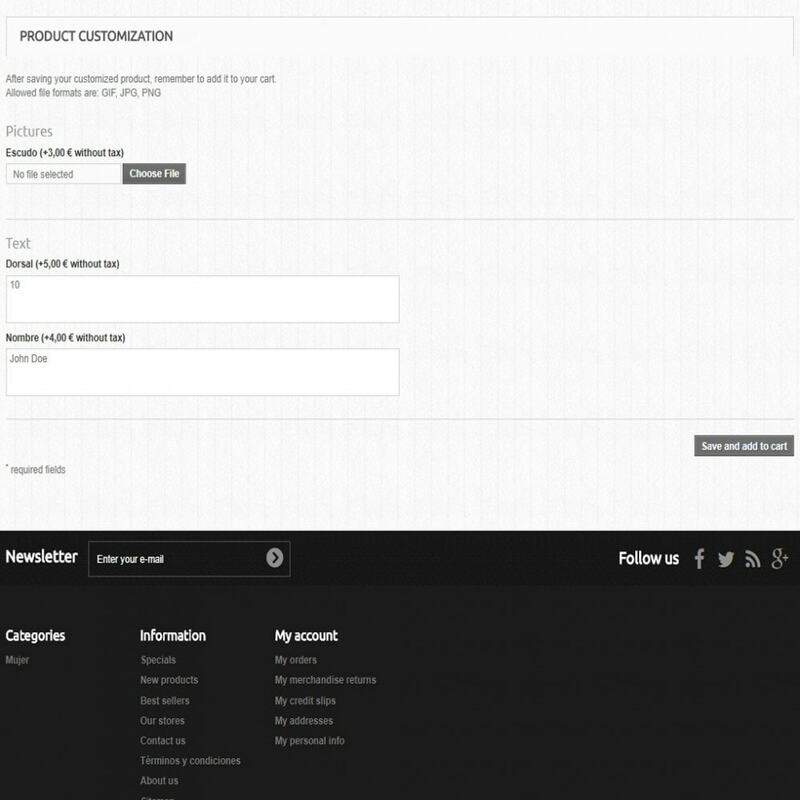 Now it is possible to clean the customizations made by the clients that are registered in the catalog. For each validated order, the removal process is automatically executed if you have this option enabled. 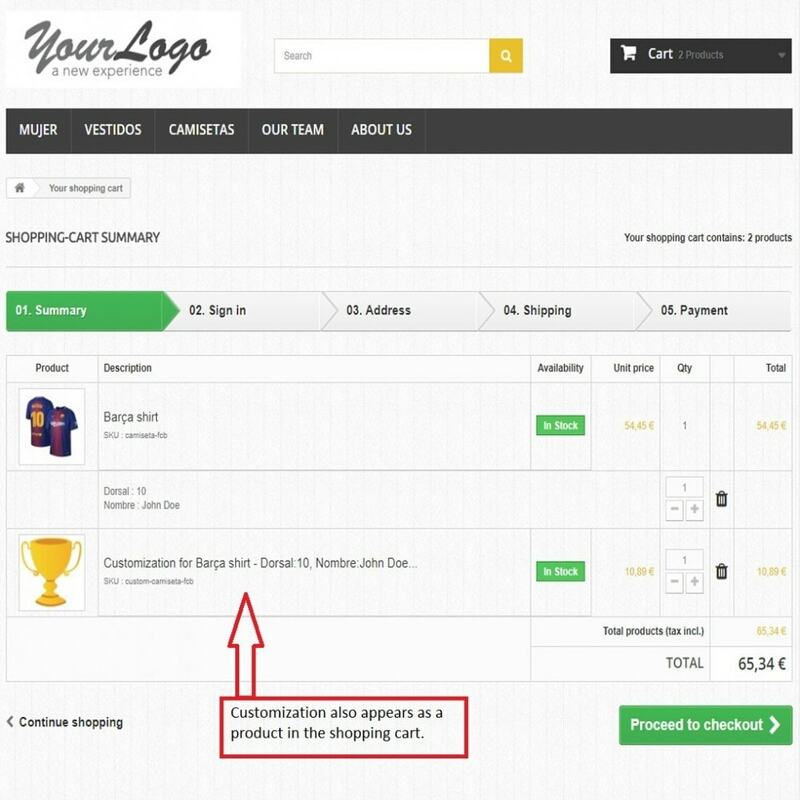 Customizations that are in the shopping cart of customers who have not purchased are maintained. Now you also have the possibility to upload an image for the customizations. This image appears in the shopping cart, in the order and in the invoice if you wish. 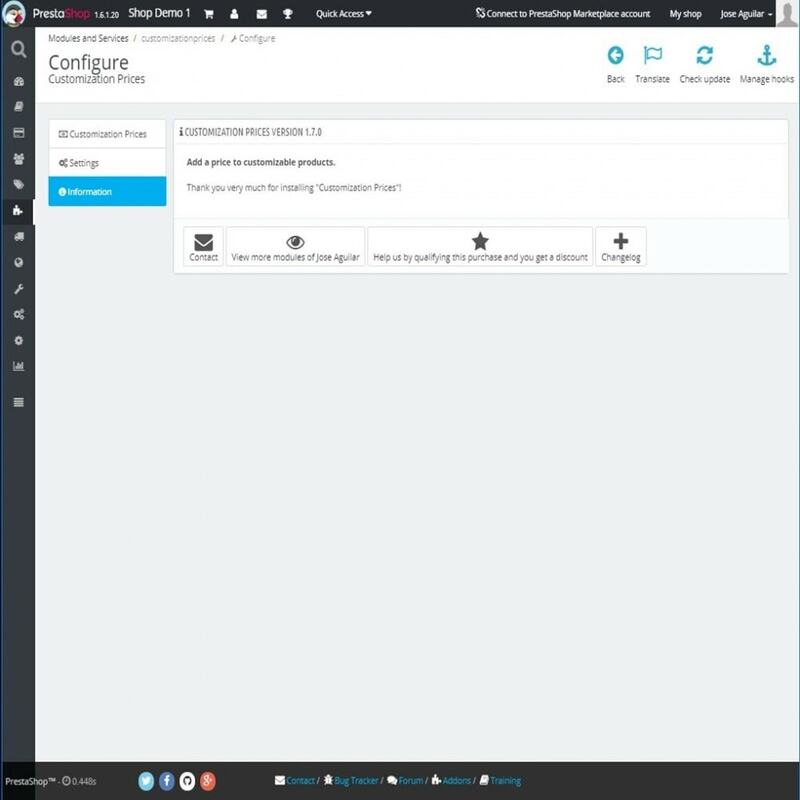 If you do not add an image for the customizations, they will appear with the default image of the product without image. On the product page that has custom fields with cost, an information table of the cost of each custom field appears. A "Customize Now" button appears that takes you to the form that allows you to add the custom fields. In this form appears the price or cost of each customization that can be applied to the product. 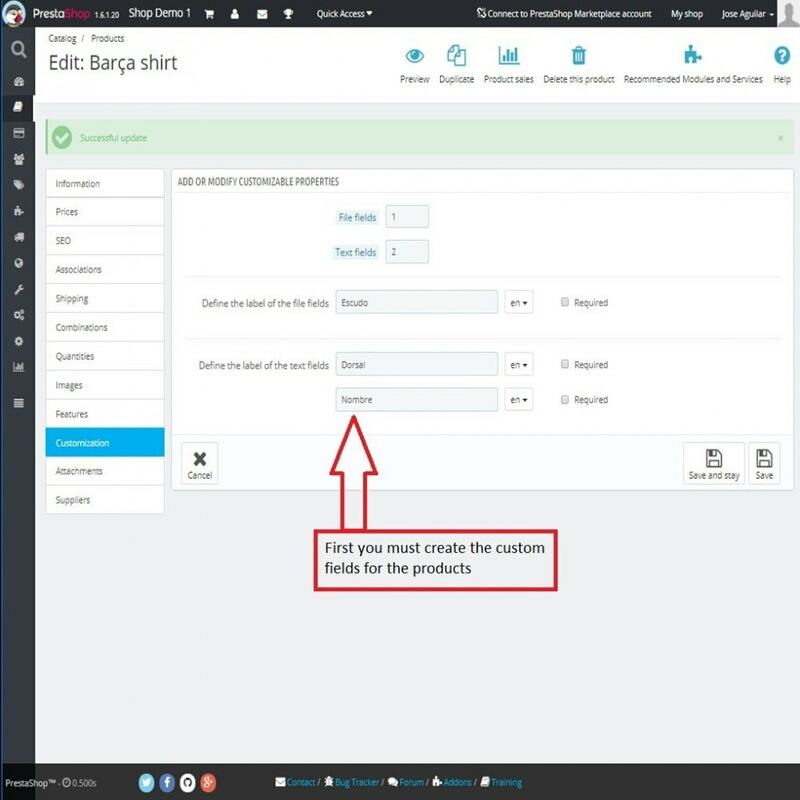 It is advisable to first create all custom fields for each product and then install the module and assign a cost. In PrestaShop 1.7 or higher if you use combinations you will need to add a code to your template that you can see in the user guide.